Convective heat transfer from the outer tube wall to the outside fluid. Heat exchangers are typically classified according to flow arrangement and type of construction. The simplest heat exchanger is one for which the hot and cold fluids move in the same or opposite directions in a concentric tube (or double-pipe) construction. In the parallel-flow arrangement of Figure 18.8(a), the hot and cold fluids enter at the same end, flow in the same direction, and leave at the same end. In the counterflow arrangement of Figure 18.8(b), the fluids enter at opposite ends, flow in opposite directions, and leave at opposite ends. Figure 18.9: Cross-flow heat exchangers. 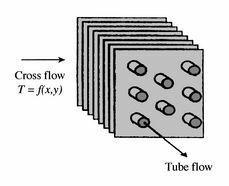 Alternatively, the fluids may be in cross flow (perpendicular to each other), as shown by the finned and unfinned tubular heat exchangers of Figure 18.9. 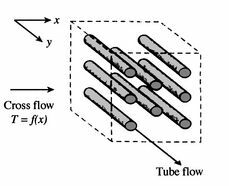 The two configurations differ according to whether the fluid moving over the tubes is unmixed or mixed. In Figure 18.9(a), the fluid is said to be unmixed because the fins prevent motion in a direction ( ) that is transverse to the main flow direction ( ). In this case the fluid temperature varies with and . 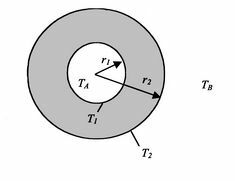 In contrast, for the unfinned tube bundle of Figure 18.9(b), fluid motion, hence mixing, in the transverse direction is possible, and temperature variations are primarily in the main flow direction. Since the tube flow is unmixed, both fluids are unmixed in the finned exchanger, while one fluid is mixed and the other unmixed in the unfinned exchanger. To develop the methodology for heat exchanger analysis and design, we look at the problem of heat transfer from a fluid inside a tube to another fluid outside. Here we have taken into account one additional thermal resistance than in Section 17.2, the resistance due to convection on the interior, and include in our expression for heat transfer the bulk temperature of the fluid, , rather than the interior wall temperature, . We will make use of this in what follows. A schematic of a counterflow heat exchanger is shown in Figure 18.11. We wish to know the temperature distribution along the tube and the amount of heat transferred. To address this we start by considering the general case of axial variation of temperature in a tube with wall at uniform temperature and a fluid flowing inside the tube (Figure 18.12). The objective is to find the mean temperature of the fluid at , , in the case where fluid comes in at with temperature and leaves at with temperature . The expected distribution for heating and cooling are sketched in Figure 18.12. 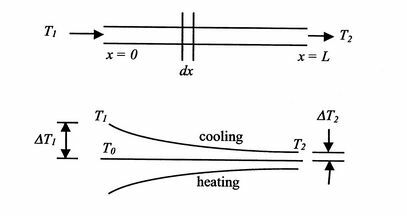 The concept of a logarithmic mean temperature difference is useful in the analysis of heat exchangers. We will define a logarithmic mean temperature difference for the general counterflow heat exchanger below. This is the generalization (for non-uniform wall temperature) of our result from Section 18.5.1.
can approach zero at cold end. as , surface area, . Maximum value of ratio . temperature difference remains uniform, .